Saturday will be a very comfortable day with highs warming into the 70s across much of state. However, locations in the Arrowhead will only warm into the 60s and perhaps not even out of the 50s near Grand Marais. Temperatures overall will be running a little cooler than average with the exception of northwestern Minnesota where it'll be a little above average. Weather conditions over the next few days looks fairly quiet across the Upper Midwest and especially closer to home. 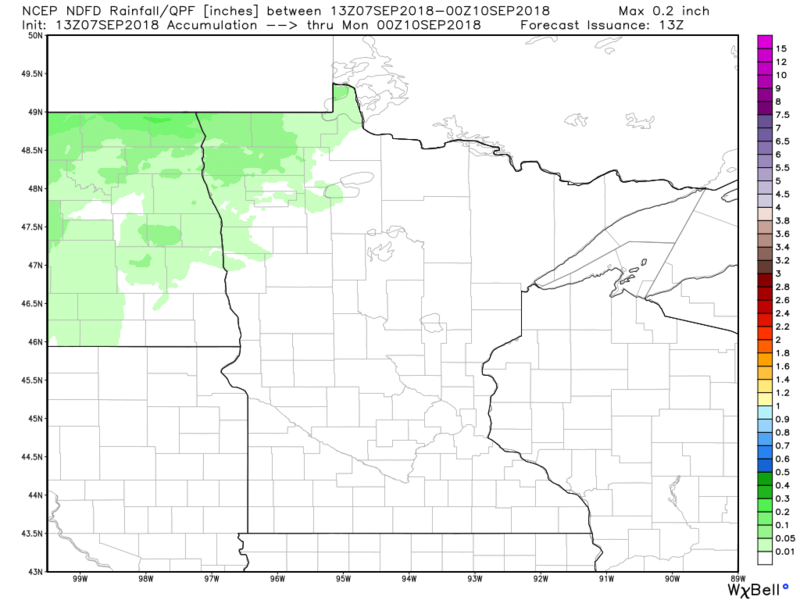 There maybe a few T-showers across the Dakotas and northern Minnesota, this weekend, but the rest of the state looks to stay mainly dry. 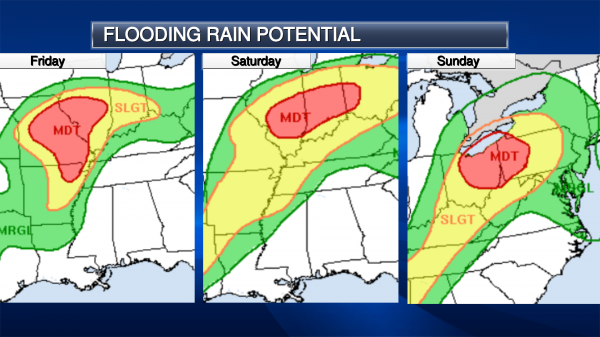 The big story will be the heavy rain across the Ohio Valley, where remnants of Gordon will drench the area with some 5" to 8"+ rainfall tallies through the weekend. 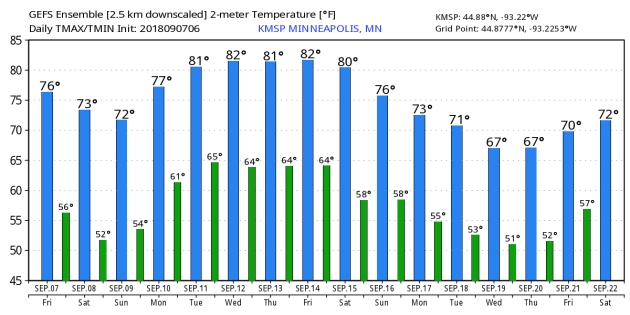 The extended forecast as we head through the middle part of September shows temps flirting with the low/mid 80s again for much of next week. Keep in mind that our average high in the Twin Cities now is is in the low/mid 70s. However, after a few days with temps in the 80s, it looks like a bigger cool down arrives by the 3rd week of the month with highs in the 60s! My wife of 34 years was always nervous about flying, specifically "clear air turbulence". I tried (in vain) to explain that you don't scream when you hit a pothole on the highway, right? Turbulence is similar, sparked by a sudden shifts in wind speed/direction. Planes are designed to handle the stress. According to Ben Carson, flying has gotten 2100 times safe in the past 70 years. The odds of being a victim in a plane crash are just .000025 percent. I'm more concerned about storms with names. The remains of "Gordon" will soak Indianapolis later today. 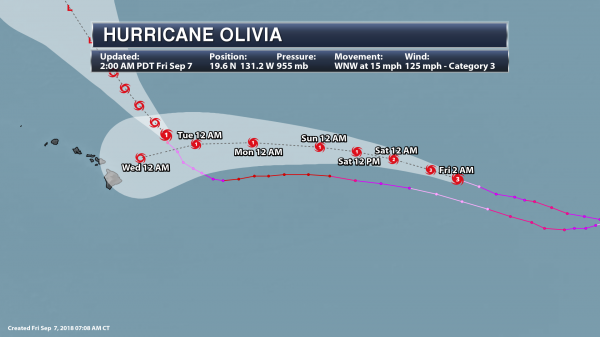 Hurricane "Olivia" may brush the Hawaiian Islands next week. And most models bring a potentially major Hurricane "Florence" into the Carolinas next Thursday. 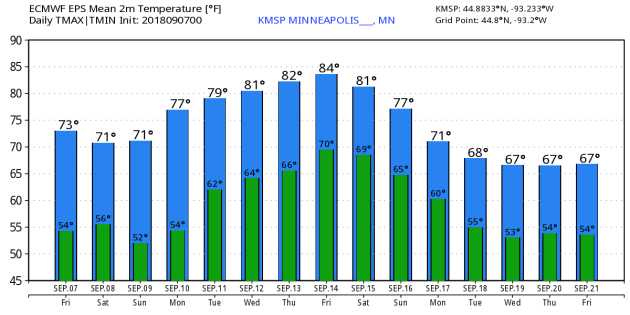 While Minnesota basks under a sunny ridge of high pressure with a streak of postcard-worthy days. Most of us won't see any rain into late next week - comfortable 70s this weekend giving way to 80s next week. I see a few timid squirts of Canadian air, but no full-frontal assaults of chilly air the next 2 weeks. Plenty of time to count our many atmospheric blessings. SATURDAY: Sunny and comfortable. Winds: E 7-12. High: 74. SATURDAY NIGHT: Mostly clear, cool and comfortable. Winds: ESE 5. Low: 53. SUNDAY: Plenty of sun, still quiet. Winds: SE 10-15. High: 74. SUNDAY NIGHT: Mostly clear and quiet. Winds: S 5. Low: 54. MONDAY: Patchy clouds, isolated T-shower? Winds: SW 8-13. High: 77. TUESDAY: Sunny, breezy and warmer. Winds: S 10-15. Wake-up: 62. High: 81. WEDNESDAY: Sticky sun, few T-storms up north. Winds: S 10-15. Wake-up: 65. High: 83. THURSDAY: August-like humidity, warm breeze. Winds: SW 8-13. Wake-up: 66. High: 84. FRIDAY: Growing risk of T-storms. Winds: SW 8-13. Wake-up: 67. High: 85. 1985: An F1 tornado touches down in Faribault County causing $25,000 worth of damage, and hail up to 1 3/4 inches falls in Freeborn and Waseca Counties. 1968: 1 3/4 inch hail falls in Goodhue County. 1931: A record high is set in St. Cloud with a temperature of 102 degrees Fahrenheit. "Heavy Rain Threat Continues In The Central United States - Watching Florence And Olivia"
Heavy rain continues to be the main story with Tropical Depression Gordon, with an additional 3-6” possible across parts of the midsection of the nation over the next several days from Arkansas to the Ohio Valley. This heavy rain will bring the potential of flash flooding to this region. We’re also tracking Tropical Storm Florence currently out in the middle of the Atlantic. This system doesn’t pose a threat to land over the next five days, but there is uncertainty in the models as to the overall track of the system after that point. 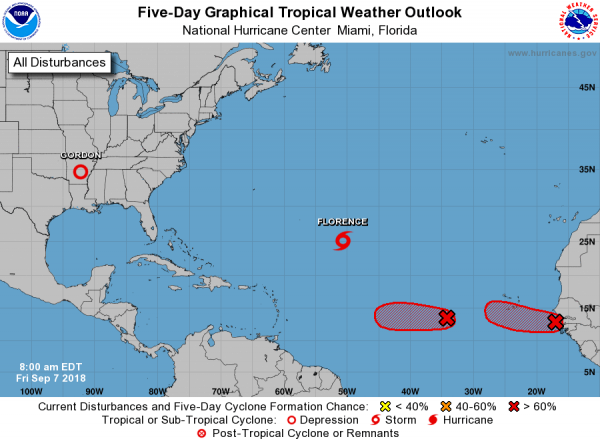 We are also watching a couple other areas of low pressure in the far eastern Atlantic that have the potential to become tropical systems over the next few days. In the Eastern Pacific, Hurricane Olivia will continue to travel in a westerly direction through the weekend. It may have the potential to impact Hawaii next week as a weaker system. Morning Radar And Satellite. Tropical Depression Gordon continues to drift across Arkansas this morning, producing some areas of heavy rain at times. As of 4 AM CT, Gordon had sustained winds of 10 mph with stronger gusts and was located 30 miles south of Little Rock, AR. The storm was moving north at 5 mph. Rainfall Forecast. The main threat with what is left as Gordon will continue to be heavy rain over the next several days as the main system continues to drift to the north and moisture from the system gets wrapped up into a stalled frontal boundary from the central Plains into the Ohio Valley. 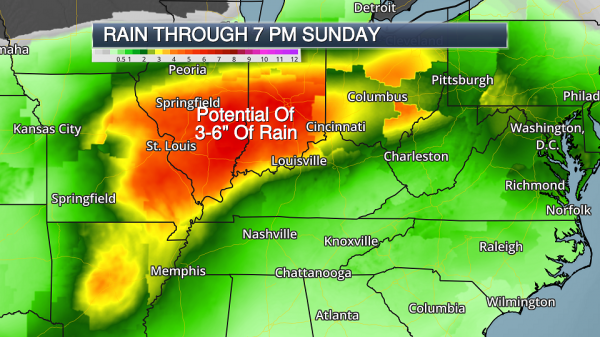 Rainfall totals of 3-6”, with isolated higher amounts, are possible through 7 PM Sunday from Arkansas into the Ohio River Valley. This could lead to flash flooding across the region. Flash Flood Watches. 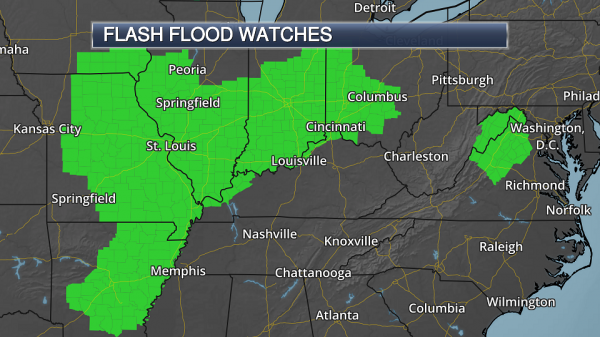 Due to the potential of heavy rain associated with what is left of Gordon, numerous Flash Flood Watches have been issued from Arkansas to Iowa and eastward into the Ohio Valley. Some of the watches across the Ohio Valley are in effect through Monday morning. The area of Flash Flood Watches that are directly west of Washington D.C. are not in effect due to Gordon; they are in effect from Noon to 11 PM today for the potential of slow-moving storms producing heavy rain. 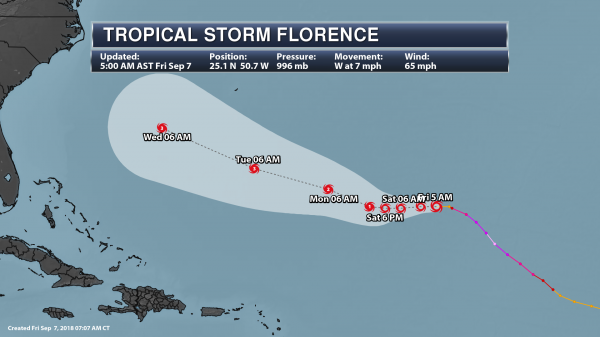 Tracking Florence. Out in the Atlantic, we’re tracking Tropical Storm Florence, which has weakened over the past 24 hours due to strong upper-level winds. As of 5 AM AST, Florence had winds of 65 mph and was moving to the west at 7 mph. Florence is expected to move to the west over the next couple days before turning to the west-northwest by the end of the weekend. Not much change in intensity is expected today, but Florence should restrengthen into a hurricane this weekend, and potentially a major category 3 hurricane by Tuesday. Right now Florence does not pose a threat to land over the next five days. Considerable Uncertainty Later Next Week. As we head into next week – especially the second half of the week - uncertainty increases with the eventual track of Florence. Ensemble models (where we are essentially running a model multiple times with slightly different parameters) continue to show a spread in the potential future path of Florence. The American models as of this morning are showing a greater potential that Florence could recurve back out into the Atlantic between the East Coast and Bermuda. The European models, however, are showing a higher potential that this system could make landfall along the East Coast. Especially with this amount of uncertainty, and the fact that this system would still be about a week or so out, it is too early to speculate what may happen with Florence and what impacts it may have on the East Coast. Florence is a system to keep a very close eye on as we head through the next several days. It may be wise to look over and make sure contingency plans are in place whether or not Florence approaches the East Coast as we are heading into the peak of hurricane season. An area of low pressure about 650 miles west of the Cape Verde Islands is becoming better organized. 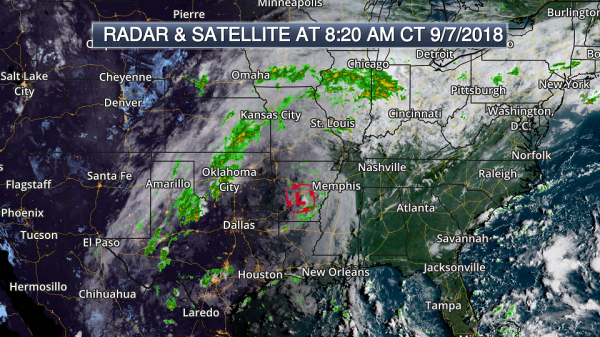 This system could become a tropical depression later today or tonight. This area of low pressure has a 90% chance of formation in the next two days. A second area of low pressure just west of the Africa coast is becoming better organized and could become a tropical depression or storm later today or tonight. This area of low pressure has a 90% chance of formation in the next two days. Tracking Olivia. Out in the eastern Pacific, Olivia is starting to gradually weaken. As of 2 AM PT, Olivia had sustained winds of 125 mph and was moving to the west-northwest at 15 mph. This system will continue to the west-northwest through Saturday, turning more to the west by Sunday, and eventually to the southwest early next week. This track would have Olivia approaching Hawaii by the middle of next week. Potential Threat To Hawaii. Numerous models have Olivia approaching – if not passing over – Hawaii as we head through the middle of next week. It is still too early to determine exact details, but Olivia should be a weaker system by this time. We will keep an eye on this system over the next several days. A majority of locations across the country will be a little cooler than average on Saturday, especially in the Ohio Valley where remnants of Gordon will trigger heavy rainfall and flood potential. After a hot week in the Northeast, things look relatively cool this week with highs in the 60s and 70s. Excessive Heat will be in place across parts of southern California and Southwestern Arizona as highs approach 110F to 120F. Did you know that lightning ranks as one of the top weather related killers in the U.S.? 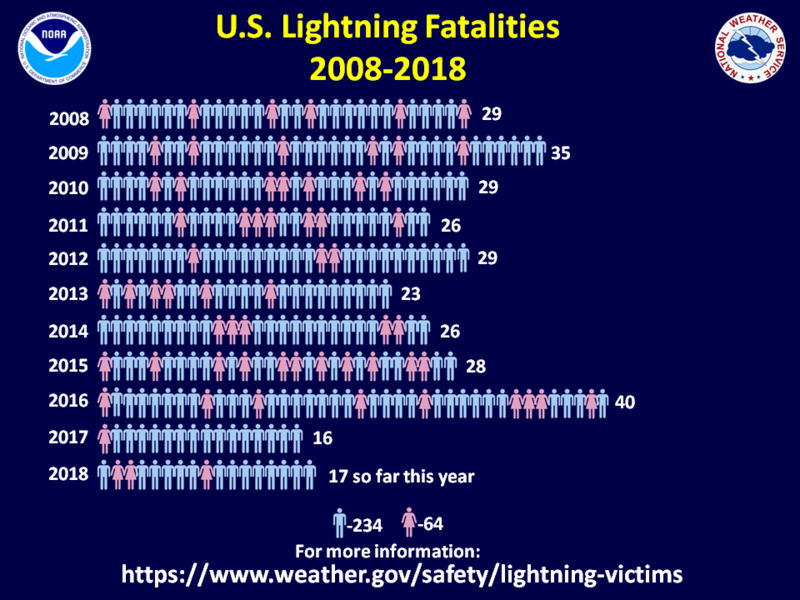 An average of nearly 50 people are killed each year in the United States and so far this year, 17 people have died from lightning; 14 have been males and only 3 have been females. Interestingly, from 2008-2017, 234 males have died, while only 64 females have died. 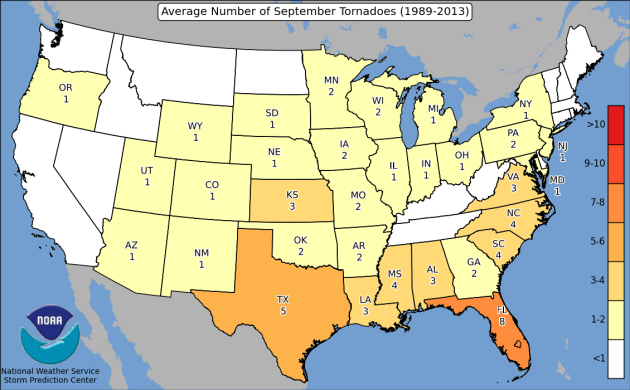 According to NOAAs SPC, the PRELIMINARY tornado count across the US this year stands at 800 (through September 6th). Note that this is less than the last couple of years, but more than what we had in 2013. 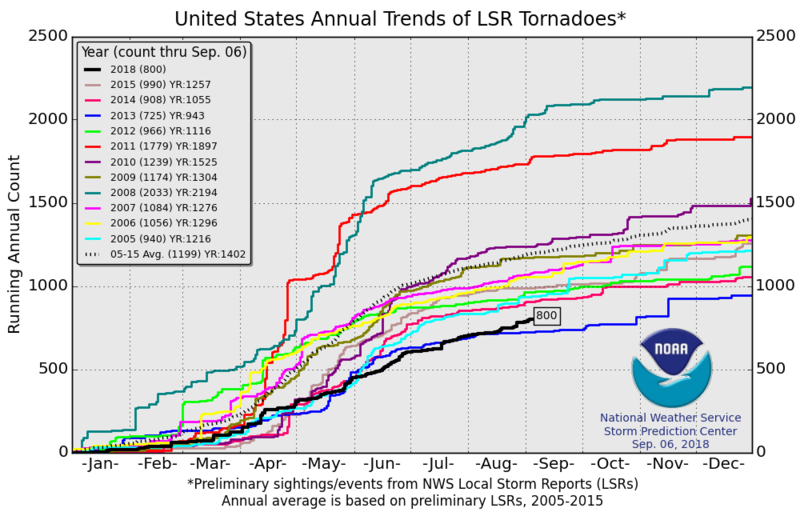 Keep in mind that the short-term average (2005-2015) suggests an average of more than 1,199 tornadoes. 1.) Heavy rain for parts of the central and eastern U.S., Sun-Mon, Sep 9-10. 2.) Significant wave heights along parts of the East Coast, Sun-Thu, Sep 9-13. 3.) Flooding occurring, imminent, or possible across parts of the lower Missouri, middle to upper Mississippi, and Ohio Valleys. 4.) Slight risk of heavy precipitation for parts of the eastern U.S., Fri-Sat, Sep 14-15. 5.) Slight risk of heavy precipitation for parts of Texas and the western Gulf Coast, Fri-Thu, Sep 14-20. 6.) Slight risk of much below normal temperatures for parts eastern mainland Alaska, Fri-Tue, Sep 14-18. 7.) Slight risk of much below normal temperatures for parts of the Pacific Northwest and northern Rockies, Sun-Thu, Sep 16-20. 8.) Severe drought for parts of New England, the middle Mississippi Valley, Great Plains, western U.S., and Hawaii. 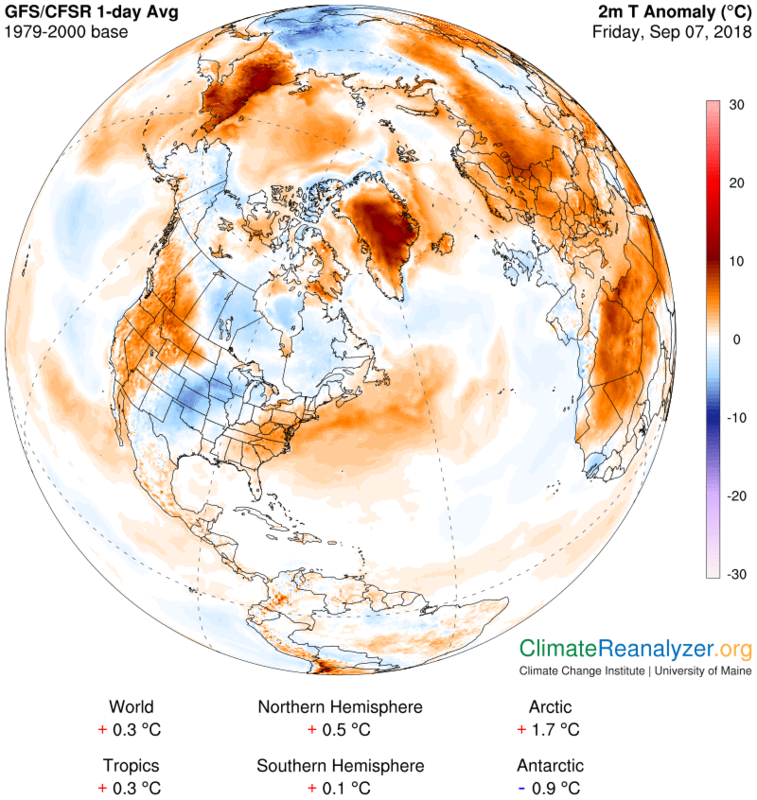 The temperature anomaly across North America on Friday showed temperatures above avearge across much of the western and eastern US. However, cooler than average weather was across much of central US and Canada. Temperatures look to gradually warm across the Central US over the coming days. Here's the temperature anomaly as we head closer to the middle part of the month. Note that there is initially cooler than average temps across much of the Central and Northeastern US, but warmer weather will gradually build in over the next several days. According to NOAA's CPC, September 14th - 20th will be warmer than average across much of the nation, while, cooler than average temps will only be found along the West Coast. The weather loop below shows active weather across the Central and Eastern US with the remnants of Gordon moving through the region. Heavy, flooding rains will make the weekend very wet and could linger into early next week across the Northeast. 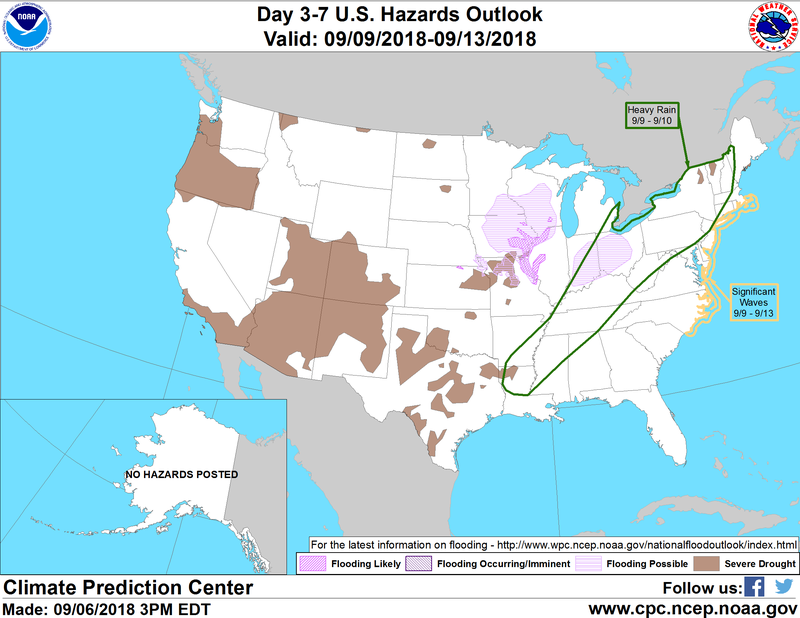 YIKES - According to NOAA's WPC, the 7-day precipitation outlook suggests areas of heavy rain across parts of the Ohio Valley and the Mid-Atlantic States. Moisture there will be associated with remnants of tropical systems, but more heavy rain could impact the Mid-Atlantic States from "Florence". There is still a lot of uncertainty at this point regarding that storm, but keep a close on on forecasts over the coming days. There will also be heavy rains across southern Texas and Louisiana, where flooding maybe possible through the weekend.